Last October, at the end of pickling season, I saw a trend of people starting to make their own mustard. The first post about it caught my attention mainly because it stressed how easy it is to make, and you're really on your own to put whatever you'd like into the mixture. I saw recipes using booze (e.g., vermouth or beer), juices, vinegars, herbs, dried tomatoes, you name it. I had to try it, and whatever I did had to be unique. I decided to make three different varieties. For the first, I remembered Meredith's bottle of green apple rum. As a drink, I can't stand it, but I thought it would make a great base for a mustard. I got to work and when it was done, it had quite a punch. I originally added two tablespoons of mustard powder, however, I changed the recipe to one tablespoon (it was a little hot). When Meredith tried it, she said that the combination of apple and heat make it scream for a pork roast. For the second, I wanted to use some balsamic vinegar. It turned out really tasty and I used it to make some coleslaw the same day. It was at that point when I noticed that the blender base was the same size as the standard mason jar lid. I no longer need to buy a spice grinder. For the third, I wanted to use some whiskey. The recipe I found also used honey. I unfortunately didn't have any rye on hand, or an inclination to go shopping and I didn't want to use my single malt so I used some Crown Royal that was a gift from my brother. Of course, my brother took some of the mustard home with him to Edmonton. Three very unique adaptations to making your own mustard. Sounds like you really can use just anything as a base, though I'm sure whiskey will really adds that extra kick. Sounds great! I need to try some! Wow, so liking the sound of your flavoured mustard variations, esp, the Whiskey which I think my Scottish friends would love. Thanks for sharing how easy it is to make you own flavoured mustard. I will def. be having a go, but as good as it may turn out - I think the husband will still have a soft spot for Dijon. @mangocheeks: still just as easy. I think dijon is dry white wine, onion, garlic, honey and tabasco (or something like that). I was floored with the number of mustard recipes out there! Dan, these flavors look amazing! I love making my own spices and condiments, and you've shown just how easy it is! 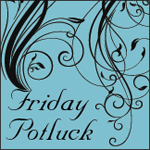 Thanks so much for linking up to Friday Potluck! How did I miss this?!! I love mustard and these sound wonderful.